Fastest Cleaner est l’un desmeilleursoptimisateurs de téléphone. Il s’agit d’un très bonbooster de ram.Il vous permet de booster vos jeux, de booster votremémoire etbatterie. Il est l’optimiseur parfait votre téléphoneAndroid outablette. Votre appareil commence à ramer et gèle de plus en plus ? Votre appareil est souvent en surchauffe ? Fastest Cleaner est la solution pour vos problèmes !!! Fastest Cleaner est un nettoyeur intelligent qui vous permetdecontrôler les applications en cours d’utilisation et de gérerlesprocessus en arrière-plan. Il met fin aux applications etprocessusqui ne sont pas utilisés et vous permet ainsi d’augmenteret debooster la vitesse de votre appareil. Notre application va rendre votre téléphone plus rapide et valuidonner une deuxième vie. Cet optimisateur va vider lecache,l'historique de recherche claire, effacer l'historique,supprimerles cookies et va mettre le registre à jour. Ce nettoyeurva gérerla mémoire pour vous assurer une utilisation optimale devotreappareil. Il s’agit de l’application parfaite qui va vouspermettrede profiter de votre téléphone comme au premier jour et nevousinquiétez pas elle s’occupe de tout pour vous. Vous allezpouvoirutiliser votre appareil de manière optimale. Notreapplication vavous assurez la vitesse maximale de votre téléphoneet va vousfaire éviter les moments désagréables d’attente. C’est lemoment debooster et de faire un clean à votre téléphone. Utiliseznotreapplication gratuite et sécurisée et profitez des avantagesdèsmaintenant ! Fastest cleaner va s’occuper de refroidir votre appareil. Ilvafermer les applications inutilisables et celle quiutilisentbeaucoup de mémoire. Notre optimisateur va vous permettredenettoyer votre téléphone, d’optimiser les performances delamémoire et d’augmenter les capacités de l’appareils et de lacartesd. Il empêche que des applications gaspillent votrebatterie,ralentissent votre appareil et le surchauffent. 🔧 Soyez informé de la mémoire ram utilisé, de la mémoirecachenettoyée et de la proportion d’utilisation de la ram parvosapplications et jeux. Fastest Cleaner is oneofthe best phone optimizers. This is a great booster ram. Itallowsyou to boost your games to boost your memory and battery. Itis theperfect optimizer your Android phone or tablet. Your device begins to row and freezes more? Your device is often overheated? Fastest Cleaner is the solution to your problems !!! Fastest Cleaner is an intelligent cleaner that allows you tocontrolapplications in use and manage background processes. Heends theapplications and processes that are not used and allowsyou toincrease and boost the speed of your device. Our application will make your phone faster and will give itasecond life. This optimizer will empty the cache, clearsearchhistory, clear history, delete cookies and will updatetheregister. This cleaner will manage memory to ensure optimal useofyour device. This is the perfect app that will allow you toenjoyyour phone as the first day and do not worry it does it allforyou. You will be able to use your device optimally. Ourapplicationwill make sure the maximum speed of your phone and willmake youavoid unpleasant waiting times. It's time to boost and makea cleanto your phone. Use our free and secure application and enjoythebenefits today! Fastest cleaner will look to cool your device. It will closeandunusable applications which use a lot of memory. Our optimizerwillallow you to clean your phone, optimize memory performanceandincrease the capabilities of the devices and SD card. Itpreventsapplications wasting battery, slowing down your deviceandoverheating. 🔧 Be informed of RAM memory used to cache cleaned and proportionofuse of the ram by your applications and games. Beard Maker Photo Editor (Beard, HairStylesPhoto Editor app) is fun face Photo editor app withdifferentBeard, Mustaches and Hair styles. Use our beard booth.Find yourbest hair style and try it now.Using Beard, Hair Styles Photo Editor you can changeyourcomplete look by wearing different Hair Styles, Beard Stylesanddifferent Mustaches and sunglasses in trendy designs.Edit your picture using Beard, Hair Styles Photo Editor appandshare your saved pic with your friends and family viasocialnetworks and have fun.Beard, Hair Styles Photo Editor app is very simple to useandfree to download from Google Play.Tips and How to use :Beard Maker Photo Editor (Beard, Hair Styles Photo Editor)isvery easy to use. Simply open the application, it will ask youtoselect a Photo or Picture from the Gallery or Take a PictureusingCamera. You can select different styles of Hair, BeardandMustaches and sunglasses which are available in the app. Onceyouselect desired Hair, Beard & Mustaches Styles andfinishadjustments on the picture then you can save it in the phone.Youcan Share or use it as profile picture.Beard Maker Photo Editor ( Beard, Hair Styles Photo Editor)letyou feel amaze by giving you all new look using variety ofHairStyles, Beard Styles and Mustaches and sunglasses styles. Free up RAM - Phone Cleaner, small andsmartAndroid device cleaner and performance booster featuring ajunkcleaner, memory booster, clean search history, app manager.deviceoptimize. clear history. With Free up RAM - Phone Cleaner youcanfree up storage, Task Killer, Game killer, boost your RAM,disableor remove unnecessary Apps, boost games and get your devicerunninglike new again. Has your phone become laggy and lack ofspace? Freeup RAM - Phone Cleaner is the speed booster & junkcleaner andoptimize you need!Free up RAM - Phone Cleaner is the smallest phone cleaneronmarket. It can boost the speed of your phone by up to 60%,andsafely clean junk files to increase available space. Withtheadvanced process monitoring technique it can intelligentlycleanbackground processes, stop stealthy running apps anddisablestealthy auto-start apps even on non-root devices. (Android4.1+)Free up RAM - Phone Cleaner (speed booster & junkcleaner)Highlights:★ BlackHole Speed BoosterHave you ever boosted again and again with no effect? Free up RAM-Phone Cleaner BlackHole Booster, unlike any other boosters,stopsthe toughest auto-start apps, 50% more effective than mostboosterson market. Optimize your phone.★ Pre-installed App TerminatorPre-installed apps are there all the time, occupying space,slowingdown your device but you just cannot delete them? For theveryfirst time, you can get rid of them with just one tap, usingFreeup RAM - Phone Cleaner Pre-installed App Terminator★ Junk File CleanerFree up space and improve the performance by intelligently scanthejunk files. Such as residual files, cache, temp files,obsoleteapks and other big files. Free up RAM - Phone Cleaner iscleanmaster.★ APP ManagerHelp you find rarely used apps, make backups and uninstall appstosave more space.★ Smart On-screen WidgetTired of an annoying floating window? The unique Floating widgetisunnoticeable but reliable, guarding your phone at runtimeandlaunch the junk cleaner in one touch.Free up RAM - Phone Cleaner (speed booster & junkcleaner)Features:Memory Boost - The best phone speed boosterClean background tasks, free up phone memory.Boost the speed of your phone by 60%, optimize games andappsperformance. go speed is best.Auto-start Manager - Keep your phone running smooth & fast-Make phone fasterForbid unwanted apps from auto-starting, boost up your phoneandkeep it running smooth (Root needed)Junk Cleaner - Small yet powerful cleaner master, space saver-Make phone fasterAnalyze all of your apps, detect junk including cache,residualfiles, temp files.Clean cache junk with one tap, free up space and boostphonespeed.Storage Cleaner - Deeply clean your phone - Free up RAM -PhoneCleanerHelp clean up the needless photos, music, documents and apps tofreeup space and speed up your device.Floating Widget - Your phone speed assistant - Free up RAM-Phone CleanerKnow your memory status in realtime. Boost up your phoneanytimewith a single drag.Smooth boosting animation design - Boosting your phone can besomuch fun.Notification Toggle - Speed up your mobile lifeAccess your most frequently used phone features in justoneplace.Your mobile life is never so speeded up.Pre-installed App Terminator - Make phone faster thanbrandnewIntelligently distinguish useless pre-installed apps fromimportantsystem services.One-tap disable the useless ones to make your phone even fasterthanbrand new. Let's have some fun! Have a greattimerecording and playing crazy sounds by using fantastic freeFunnyVoice Changer app for Android™. Download this amazingvoicemodifier and audio editor for free to make yourvoiceunrecognizable and very funny. This sound booth is fantasticforall kinds of pranks, so don't hesitate, do something reallyfunnyand laugh all day with this new voice recorder app. You canuseHelium voice, you also have many different choices, enterandexplore our application !! !Funny Voice Changer features:☺ Helium voice recorder!☺ Hilarious funny voice recorder!☺ Cool voice changing app with cool sound fx!☺ Fantastic prank soundboard!☺ Instant play of a modified voice!☺ The best funny ringtone maker!☺ Awesome notification sound and alarm sound editor!☺ Great funny voice changer software free download!☺ Male to female voice changer!☺ A wide range of funny voices and scary sounds!☺ Save and share your new sounds with your friends!Whenever you want to have a funny deep or a tiny voice orheliumvoice, use this funny voice changer free download to playsomefantastic sounds. Use this voice recording software to recordwhatyou say and then modify the tone and speed of your speech withthisfantastic voice modulator. With this special sound effectnobodywill recognize your voice, so you can use them to make fun ofyourfriends and family and have the best time of your life.☺☺☺ Cool ringtone maker! ☺☺☺Get the best comedy ringtones, funny alerts and sms soundswithfunny sound effects. Record your voice and use this male tofemalevoice changer to get something really crazy. These funnysoundclips will make you laugh out loud all day long. So get one ofthebest talking games for free and have fun with your friends.☺☺☺ Best voice changer with funny sound effects! ☺☺☺Download Funny Voice Changer free download and play withthedistortion of your voice. Use this fake voice call changer maleandfemale to make pranks on your friends and family. Customizeyourvoice and sound the way you have always wanted. The pranksoundeffects are here for you to play with one of the bestvoicechanging games ever! Enjoy! Scary clown face changer - are differentthanregular lipstick games or eye editor apps! Thesespecialized"makeup games" let you look scary in Halloween. In justa few taps.Halloween Makeup Salon Games can turn you into a witch, asugarskull, monster, or a zombie, anonymous mask, with "faceeffects"and stickers for pictures! Become a character from horrormovies,or horror games and stay glamorous with « Horror masks »!This cool face swap app lets you change faces with clownmasks.Pick from the collection of photo stickers and Halloweenstickersfor your selfie.! We offer creepy, and horror masks ! Andsomespooky photo frames so you can enjoy the ride! You will be themostthe most dangerous one. Try this "makeup app" which iscompletelyFREE of charge and enter a virtual beauty salon! This eyecolorchanger for photos will give you a perfect look which you canshareonline! on social media. Lips and "eye makeup" forspecialoccasions has never been easier! Forget about step bysteptutorials and get this user-friendly Halloween dress up and"photomakeup editor"!Super realistic Halloween games and face editor all inone.“Halloween makeup photo editor” & face editor!Scary Clown Face Maker" offers face makeup editor & coolfacefilters!Save the makeup camera pictures and set them as aHalloweenbackground!Add picture frames once you finish your virtual makeover and haveacomplete work of art!Pick a photo from your photo gallery or take a selfie andstartphoto editing!Scary photo effects in these make up games let you createuniquescary backgrounds!Choose any of the Halloween stickers and tap on it tomanipulateit!Halloween makeup salon games lets you zoom in, zoom out ordragpictures!Halloween yourself share your cool pics via Instagram TwitterorFacebook.Horror Makeup Salon Games are better than any costume ideas forahorror face! If you need a photo effects app that make you looklikeyou have magic powers and super powers, you are at the rightplace!Transform yourself with this makeover app and clown scaryfacechanger camera for free. Halloween stickers for your selfiewillturn you into a scary or a sad clown instantly with scaryfaceeffects and cool Halloween makeup. Regular lips makeup issooverrated, so turn your face beauty into a scary clown,monstermakeover or any other character from horror stories! it canturn toa funny face maker, and funny makeup maker. So hurry up andget thecoolest face edit before everyone starts copying you withphotostickers! And – don't forget to use one of the best Makeupphotoapps as scary wallpapers! Free download this photo editorforAndroid™ right now!Don't waste your time anymore - go try clown games andhorrorface changer camera right now and let the photofuniabegin! As many of us have small phones or oldphoneswith small specs we face a lot of problems when the memory ofourapp get filled..Is your device performance slowing down? is the unwanted Appsandredundant files occupy your mobile device storage space?Well, Our App Fast Cleaner, Power Booster will help your phone tobemore faster, smoother and quicker! Fast Cleaner is an easyandeffective app for all Android devices to boost your phone speed.This App will not promise to x2 (double) the speed or yourmemorybut it will optimize the way your apps are using memoryspaces andthat will help you Android Device to boost the Speed by30% and alsowill manage the space in your memory if you run thememory cleanerin our app.Application Features★ Speed Booster★ Clean The Cache Of Your Phone.★ Memory Cleaner & Booster★ Battery Saver★ CPU Analytics★ Remove Junk FilesThis app will optimize your battery life and will give yourphonemore speed by just optimizing how apps should get theresources ofyour phone and be sure that you are going to enjoyit.★ CPU USAGEFast Cleaner will help you to clean apps that cause overheatinginyour CPU Precessor in one click.★Cache CleanerThis function will give you the possibility to cleancachejunks,obsolete trash, ads files, memory cache and otherjunkfiles.★Battery SaverBy using Fast Cleaner - Power booster you ensure thatunnecessaryapps are not running in background and your memory isclean andalso your CPU is on for necessary apps only that will makethebattery life resist and stay longer.★Memory BoosterBy Cleaning unnecessary apps that runs in the background youassurethat your phone gets the best space in memory (RAM) so thatwillmake it increase by 30%.SPECIAL★ ONE CLICK FAST CLEANER WIDGET AVAILABLE.Fast Cleaner - Power Booster is 100% FREE and 100% GREENcleaner,give it a try! Fast Cleaner - Speed Booster, savebattery,clean junk files and free RAMIs your phone getting slow or out of space? Fast Cleaner:SpeedBooster is the best speed booster and junk file cleaner thatwillremove junk files from your phone, make your phone or tabletfasterand free the memory and storage space.Fast Cleaner: Speed Booster is able to boost your phone speed byupto 50 % and save more battery by 30 %. The secret is thatthiscache cleaner and battery saver stops unnecessary appsinbackground to clean RAM and speed up your Android device.Itstopalso apps from auto-start to save battery power and keep yourphonewith a cool CPU.Main Features of Fast Cleaner - Speed Booster:★ Speed Booster★ Cache Cleaner★ Memory Booster★ Battery Saver★ CPU Cooler★ Root Free★ Speed Booster★ Cache Cleaner★ Memory Booster★ Battery Saver★ CPU CoolerCPU cooler - Effectively cool down CPU temperature :Is your phone always heated ? Fast Cleaner: Speed Booster cancooldown temperature and reduce CPU usage by stopping overheatingappsand make your battery last longer.Other Features of this Trash Manager - Cache Cleaner:★ Free Application★ Amazing GUI★ Multiple Functionnalities★ Multiple choices in settings and preferencesPlease if you like our application do not hesitate to leaveareview, if you have any trouble please contact us via ourmailadress provided bellow. Speed Cleaner (Clean Booster) is the bestphonecleaner app that clean junk files and ultimate optimizer toolthatboosts your phone speed. If you ever wonder why your phoneslowsdown after only a few months of owning it and don't knowanythingabout cleared cached data, junk file cleaning, clean rambooster,memory clean up, or clean memory, then this is the perfectclean upapp solution to speedup your slow phone.You don't need to worry about knowing how to cleancache,optimize battery power, phone clean up, clean ram booster, ortempfile cleaner. Speed Cleaner (Clean Booster) features a onetapboost solution that takes care of everything for you, so youcanclean up junk files while sipping on your morning coffee!SpeedCleaner is one of the most easy ram booster, battery boosterpro,memory clean, and quickest cleaner apps to use. Just taptheone-click boost and let Speed Cleaner do all the work to speedupyour phone to maximum speeds!Does your device overheat, drain battery, freeze, or feellaggyat times? Speed Cleaner is the cleaning master when it comestojunk file cleaner, boosting phone speed, memory mastermanagementtool, clear master, and cache master. This cleaner appwill clearjunk files that slow down your phone, clear cached filesthat drainyour battery, and kill background tasks that can freezeor makeyour phone feel laggy. Speed Cleaner (Clean Booster) isanall-in-one master cleaning app with game booster, cleanermaster,phone booster, memory booster, and battery optimizer!FeaturesOne Tap CleanerThe easiest one tap boost solution to clean all the junk filesandclear cached files that would normally slow down your phone.Speedup your phone by doing a quick memory clean that involvesdoing afull clean sweep.Ram BoosterBoost ram speeds with the free ram booster featured included inthisspeed cleaning app. Your games and apps will run faster asmemorymaster will optimize and boost your phone ram.CPU CoolerDoes your device constantly overheat and need to cool down?CPUcooler optimizes your device performance and running processestokeep your device cool. It is the ultimate optimization tool tokeepyour processes running smoother.App ManagerThe best app optimization tool that lets you kill backgroundtasksthat would cause your phone to freeze. Monitor and manage allofyour power consuming tasks from a single screen.Speed Cleaner (Clean Booster) is the ultimate speed boostertoolto clean up junk files on phone and speed up phone. Try the onetapboost device cleaner and say goodbye to laggy slow devicespeeds!Clean junk files, keep your device from overheating, andoptimizeyour device performance with ram booster speed up.Enjoy the #1 New Boost Cleaner and easy ram booster forfree!Download the fastest memory cleaner booster today! Lots of idle apps nibble Android phones’performance, battery and traffic. Kinds of useless files slow downphones’ speed. All of them would make the phones slow, lagging, hotand consume big electricity. Movup Clean focuses on betteringAndroid phone performance. With its four major roles of speedbooster, junk file cleaner, phone cooler and battery saver, itallows your phone to run smoothly all the time.★Junk File CleanIntelligent Cloud Engine reads everything and will make all thejunk files nowhere to hide. Movup Clean could clean the junk files,idle storage and useless large files from millions of apps, thusreleasing plenty of free space.★Phone BoosterMovup Clean could end the unused apps easily with just one click,so as to release more memory space and make the phone run moresmoothly.★Protect PrivacyWith app lock, you can lock up your apps such as Facebook,Messenger, Twitter to protect sensitive information. While lockingthese Apps up, it releases the memory space and improves thespeed.★CPU CoolerMovup Clean can monitor device temperature and smartly closebattery draining apps that cause overheat, thus cooling down theCPU temperature and extend its life. Real Boost Cleaner is a small, fast, andsmartAndroid device cleaner and performance booster, featuring ajunkcleaner, memory booster, device optimizer, app manager. Withthisapp you can free up storage, boost RAM, remove ordisableunnecessary Apps, lock apps, boost games and get yourdevicerunning like new again. Real Boost Cleaner helps you to free up storage, clean upmemory,stop autostart Apps, remove or disable unnecessary Apps,know yourdevice, optimize and speed up it. Just one click, you’llbe theOptimize Master of Android. Features:* Free up storage and optimize performance by removing oldjunkfiles and clutter such as system cache, residual file, cleaningoutthe download folder, and more. 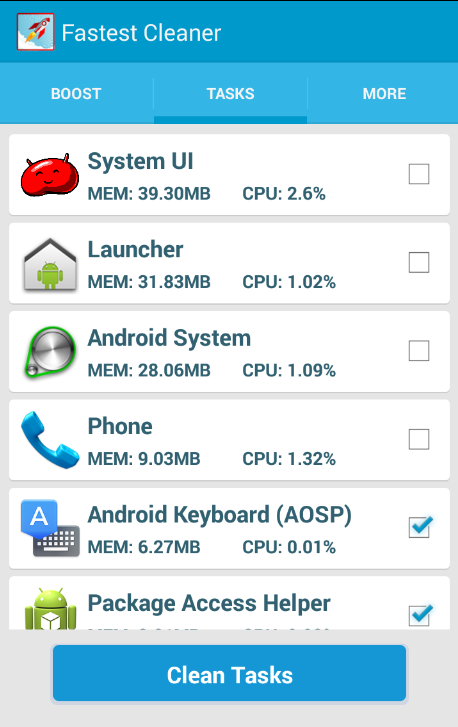 * Clean up memory (RAM) and optimize phone speed byremovingredundant background tasks. Stop auto-start Apps toincrease bootspeed and reduce memory usage. 1-tap memory cleanerand boosterwidget makes it easy to clean your phone directly fromthehomescreen. * Easy to batch uninstall unwanted Apps or backup importantones.Disable pre-installed and system Apps. Scan and cleanredundant APKfiles. * Handy status of CPU, memory (RAM), GPU, camera, storage,ROM,battery and hardware features.Keep track of memory (RAM),storagespace and CPU/battery temperature.Stop Apps from wastingbatterylife and causing device to overheat. TuneUp task manager'smemorythresholds to optimize your phone's performance. * Save battery life 60%Real Boost Cleaner is 100% FREE cleaner and booster. Try it freeandget your Android phone or tab running like new! Cleaner for Android is the most effective optimizer for yourdevice. It helps to remove up junk files, boost your phone speed upto 85%, find rarely used apps and uninstall them with just one tap.Cleaner for Android Features:-Junk File CleanerCleaner for Androidis a junk file remove master that can intelligently analyze andclean junk files to free up more space and improve the performanceof your device, such as residual files, cache temp files, obsoleteapks and other files.Memory Booster - Phone Speed BoosterPhoneBooster feature is very useful for stopping backend app process,and it helps free up RAM and cool down CPU temperature.APP Manager- Uninstall Apps EfficientlyDo you feel troublesome to uninstallapps? With App Manager, you can easily view apps by storageconsumption, use frequency and select the apps you would like toremove and uninstall them together without executing moreoperations.